Where in the first half of our centennial we focused on events in Champaign-Urbana, this fall has brought opportunities for the Press to shine in Chicago and Springfield through partnerships with Jane Addams Hull-House and the Conference on Illinois History, respectively – underscoring our position as a “System,” or university-wide, unit. These partnerships help raise the profile of both organizations, as well as strengthen our synergies and generate ideas and energy for future initiatives. 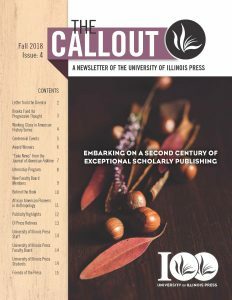 With this issue of The Callout, we highlight an exciting cluster of new journals in Mormon studies, reinforcing our commitment to this area of historic strength and to our society partner, the Mormon History Association. We announce a new fund that will provide support for titles across our list with a common emphasis on progressive thought. We share high profile media hits for titles in African American history, music, film studies and women’s history, and our science fiction series. Our fall newsletter also celebrates an important anniversary – forty years of publishing the series The Working Class in American History – which we’ve marked with several events (at the Newberry Library, at the North American Labor History conference in Detroit) that reflect on the series’s past and future. Most of all, we toast the people who give their energies and resources to make the Press successful. We welcome new and returning student assistants and interns as well as new faculty board members. We bid farewell to two longtime IT staff heading to the greener pastures of retirement. And we are grateful for our friends and donors who share our vision and core commitments and help us in sustaining our mission. As our centennial year winds down, don’t miss your chance to register (by December 1) for a chance to win our third and final IPad loaded with 100 U of I Press ebooks. And, consider joining us as a Friend of the Press by the end of our centennial year to be designated a “Founding Friend.” We need every one of you! Check out the rest of the issue here!